I just need to know how late they are open on Saturday night. I need to be about 2 miles away from there tonight and wonder if it makes sense to drive over there or will they already be closed? midas wrote: I just need to know how late they are open on Saturday night. Phone number, 10-seconds on Google Local. Yea, the good news is they were indeed open when we got there. The bad news, I'm now about $25 poorer. And we never even hit the deli. Hard to believe you can spend that much in a bakery, but we found a way. Ohhh, man... you missed some mighty good corned beef, you did. I stand by Kaufman's being the best in Chicagoland. Oh yea, the deli could have cost me another small fortune. But the place I was going to wasn't going to afford me the option of refridgeration. So I didn't want to buy something and have it sitting in the car for 4 or 5 hours. Evan B. Druce wrote: Ohhh, man... you missed some mighty good corned beef, you did. I stand by Kaufman's being the best in Chicagoland. Evan, I do admire your determined support of Kauffman's and one day I will try it based on your recommendations. I would have done that already, but it is a long way from N'ville, and I never had figured out exactly where it is before now. No excuses left, so when opportunity knocks, I will be there. Not much action on the Kaufman's thread, but I wanted to put in a plug for my current carbo crush, Kaufman's Corn Rye bread. Deep rye flavor, earthy, slight sour tang, chewy interior with crisp crust, double the caraway of regular seeded rye and highlights of cornmeal crunch. Perfect with a swipe of mustard and pastrami, sheer soul satisfying simplicity with sweet butter and sea salt, heaven nestled up to pair of over-easy eggs. I haven't rendered schmaltz in years, but Kaufman's corn rye has me longing for a slowly simmering vat of chicken fat with toasty caramelized onions and gribbenes. And, the highest praise of all, it's the Midwest Jewish deli doppelganger of Langer's rye, on which rests the pinnacle of pastrami perfection. I should note amid the savory one of my brides favorite breakfast treats is rye bread and strawberry jelly topped with melted baby swiss cheese. Rye [sic], my sense of humor may not be, but my bread most certainly is! I remember really liking the bagels from here when I worked down the street many years ago. Never got anything from the deli but would like to go back for nostalgia sake. I'm with you completely, Gary. We eat mostly rye bread at my house, and Kaufman's rye is outstanding and much better than their bagels, in my opinion. The problem with Kaufman's is that I can't just stop at the bakery there--the deli stuff is too tempting but also expensive. Tel Aviv Kosher Bakery on Devon also makes an excellent rye. Maybe we should have a rye bread taste-a-thon. It would be a nice, cheap carbolicious experience. EvA wrote: I'm with you completely, Gary. We eat mostly rye bread at my house, and Kaufman's rye is outstanding and much better than their bagels, in my opinion. I agree, while a fan of Kaufman's corn rye, like the pumpernickel as well, I'm not a big fan of their bagels, my preference for bagel and bialy is New York Bagel and Bialy on Touhy. I do like Kaufman's corn rye bagel, something about the corn/rye combination floats my boat. The deli is fine in a pinch, though their new pickles and pickled green tomato are fine examples of the Jewish deli style. I'd be curious to know which local Jewish Deli you prefer to Kaufman's when not "In a pinch". Agreed again. My daughter and I might starve without NYB&B bagels. We are regular and major consumers. Like stevez, I'm curious what local Jewish deli you prefer to K's. You've got to pick and choose if you want the best stuff: knishes at Steve's, kichel at Tel Aviv, smoked fish and cornmeal rye at Kaufman's, etc. Thanks to GWiv for bumping this thread and reminding me of Kaufman's Deli. Kaufman was my first jewish deli experience. The bagels were better in terms of size, texture, quality, etc. compared to my previous experience with bagels which was corporate chain places. It was quite a revelation compared to that. Do you think that's still the case? My co-worker grew up going to this place and got our whole department hooked on them for our weekly splurge and the cream cheese flavors were great. I haven't been to Kaufman's in about 15 years so it's probably the nostalgia factor. I'll definitely go to NY Bialy place to compare! Oh, and I'm in w burb now and I don't get up that way that often and it's hard to find a good bagel place around here so I appreciate the recommendations. gooseberry wrote: I'm in w burb now and I don't get up that way that often and it's hard to find a good bagel place around here so I appreciate the recommendations. You know you have a pretty good Jewish deli of your own out your way, right? Kaufman's bagels are chewy and dense, especially compared to the Einstein's and Cosi's of the world. They are smaller in size but probably about equal in weight. I love the rye and pumpernickel bagels. I wish they had salt bagels, a particular guilty pleasure of mine. Other Kaufman's bakery faves are the rugelach, which receive raves wherever I bring them. (Not quite the raves I get for my homemade rugelach, but who has time for that?). I love the swirled rye and the corn rye, both great for meaty sandwiches, or egg/tuna salads. Kaufman's has great fish - try the smoked trout which is probably the best deal in the store. I think it's well under $10/pound (6.99?) and it's smoky and oily and fishy in all the best ways. Since Best's kosher is gone, Kaufman's sources their salami from Romanian Deli - the true mecca of kosher meat. I think they also carry Romanian hot dogs, which are NOT to be missed. Kaufman's rye bread is the best but does not stay fresh long. After a day it loses something. We love their chopped chicken liver too. The barrel of pickles provides a good dill to accompany the corned beef. Lines can be long in both the bakery and the deli but worth the wait-we do the double ticket dash. Elfin wrote: Kaufman's rye bread is the best but does not stay fresh long. After a day it loses something. I've found just the opposite, the corn rye, which is my typical purchase, lasts a surprisingly long time with little change in flavor or texture. I think that Kaufman's has the best non-homemade chopped liver in the area. Their rye breads are also excellent. I'm not a fan of their bagels, though, because they lack that hard outer shell and are not dense enough for my liking. Franabanana wrote: Kaufman's bagels are chewy and dense, especially compared to the Einstein's and Cosi's of the world. They are smaller in size but probably about equal in weight. I love the rye and pumpernickel bagels. I wish they had salt bagels, a particular guilty pleasure of mine. Being born with an overactive "lazy gene" I try not to work harder than I have to. I am about to speak a blasphemy to true foodies everywhere. What follows is a Bread Machine recipe for salt bagels, (or salt Bially depending on how you shape the dough). Dump all the ingredients in the order given into the bred machine, (assuming that your machine has a dough setting) set the machine and walk away or do something else for about an hour, (my machine dough cycle take 1 hour 3 minutes). When machine stops, empty dough out onto a floured board and knead by hand until satiny and smooth, (takes me about 1.5 minutes). Place dough into an oiled bowl, cover with a dish towel and allow a second rise for about 30 minutes. After dough has risen a second time cut dough into 32 equal balls, (they will be about 1 oz. each), form the dough into ropes just a bit longer than your two hands together. Wrap the dough rope around your dominant hand and roll it into a bagel shape, (this is the tricky part and your first few efforts will look like the work of an uncoordinated kindergartener, but it will not effect the taste. Cover with towel and allow a 3rd. rise of about 30 minutes. Put approximately 1 gallon of water into a large non-reactive pot and bring to a boil. Add 1/4 cup granulated sugar to pot and stir. 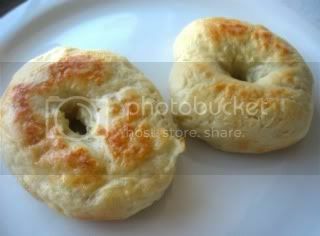 Drop bagels, two at a time into the boiling sugar water and allow to boil two minutes... turn over and allow to boil on opposite side an additional two minutes. Remove bagels to a greased cookie sheet sprinkled with corn meal, (otherwise the wet dough will stick to the sheet and be a mess). Preheat your oven to 425F and place a small container of water into the oven to raise the humidty. Boil the rest of the bagels until they are all on the sheet. Sprinkle the tops with a small amount of coarse Kosher salt or Pretzel salt, (you can also use cinnamon sugar, poppy seed, caraway seed, sesame seed, dried onion or sauteed garlic... among other things). Bake in center rack of the over for 8-10-15 minutes until crust starts to brown then slide sheet out and turn bagels over. Return to oven and brown the opposite side for an additional 8-10 minutes. These bagels do not live well in plasic food bags, ans since there are no preservatives, they will stale out quickly. I have found that they will keep fairly well in a paper bag in the fridge for a couple of days, (freshen then for 10 seconds in the microwave if the harden too much to cut) and will freeze in a paper bag for a couple of weeks. You can also use the same recipe for making soft pretzel rolls if you substitute 2/3 cup baking soda for the sugar in the boiling water bath. tortminder wrote: I am about to speak a blasphemy to true foodies everywhere. What follows is a Bread Machine recipe for salt bagels, (or salt Bially depending on how you shape the dough). While some may have alternative methods, anyone who quibbles with making them yourself is the one who is blasphemous. Gotta agree with that 100%. Great post, tortminder. Recently partook of a Jewish Bouquet from Kaufman's at a visitation, which renewed my enthusiasm for Kaufman's deli. I've always been a fan of the bakery, in particular corn rye bread. This exceptionally thoughtful platter, really more tower, hit all the high spots except for tongue, which I imagine is not as universally accepted as corned beef and friends. Been thinking about tongue the last few days so I stopped by Kaufman's for a tongue, chopped liver and coleslaw on rye with spicy mustard. Right on the money, and I love the fact at a real deli no one looks at you cross-eyed when you order combos that might seem odd to uninitiated. Since it's not far down the street from us, I'll say it before Gary does. I picked up some pastrami from Kaufman's yesterday, and its all long gone now. Some of the best I've had in a long time. Just a comment that although bakers do sometimes use cornmeal on the peel when baking this bread, the name of this style of dense rye, which we just used to call "corn bread" when I was growing up, comes from the Yiddish word korn, which means "grain." There's a very good recipe in George Greenstein's "Secrets of a Jewish Baker." LAZ: Thanks for that explanation. I grew up eating and loving "cornbread" (we never called it cornrye) and assumed it had something to do with "corn" although I was never sure what. Perhaps I should have aksed my native Yiddish speaking mother? I love the fact at a real deli no one looks at you cross-eyed when you order combos that might seem odd to uninitiated. Right on. The combination of tongue, chopped liver and coleslaw is something I would not have thought of, and I am intrigued. I haven't had tongue in ages. Have to do something about that. Jonah wrote: I grew up eating and loving "cornbread" (we never called it cornrye) and assumed it had something to do with "corn" although I was never sure what. Perhaps I should have aksed my native Yiddish speaking mother? Don't feel bad. I grew up thinking "tongue" was a Yiddish word for a particular deli preparation of beef. I think I was in high school before I realized it was accurate English.